I am cooling my jets in the Charlotte airport, my layover on a return trip to Minnesota. This is a good thing, not lemons. Tomorrow, my sister will pick me up in Minneapolis and we will drive back to Florida….girl trip, just Kim and me and her two little dog princesses, Nissa and Nya. Kim starts her new job in Ocala next week. I am so excited to have this be the future I get to talk about; that being sisters, being family no longer has to happen long distance. This is most definitely not lemons. Gordy is manning the home front…horses and dogs and massive amounts of green grass and weeds needing to be tamed. I am grateful for his kind goodness in making this trip work with minimal anxiety to me about leaving everyone again, just when I had returned. No lemons here. Bruno is heartworm positive. We made a trip to our vet thinking we’d get out with a bit of an ear infection to address. Lemons. An unholy amount of lemons. Nursing a dog through heartworm treatment is a serious commitment. 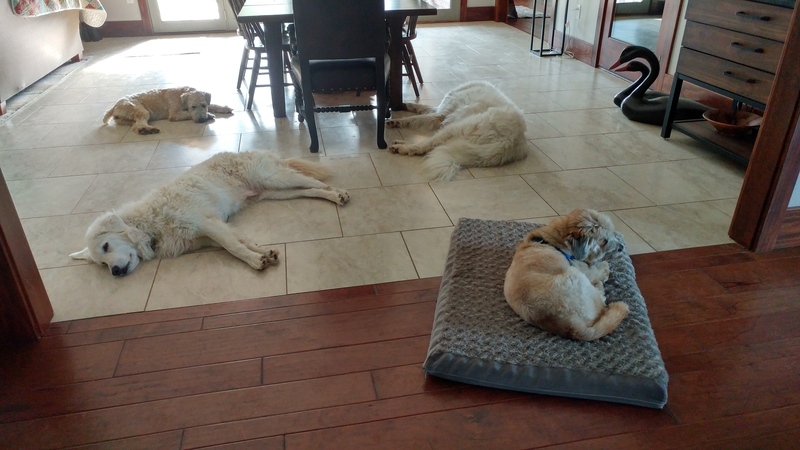 It takes months and, during the big part of it, the dog must be kept completely inactive and calm; crated, walked on a leash for personal duties only. Not running down to the barn for chores. Not playing in the backyard with your new dog buddies. My heart breaks a little just saying this. What a bum deal for him. What a bum deal for us. I worry about the risks to him. I worry about how to make this work; not just for him, but for us and the rest of the crew. Lemons. Ah, but have you noticed how cute Bruno is? 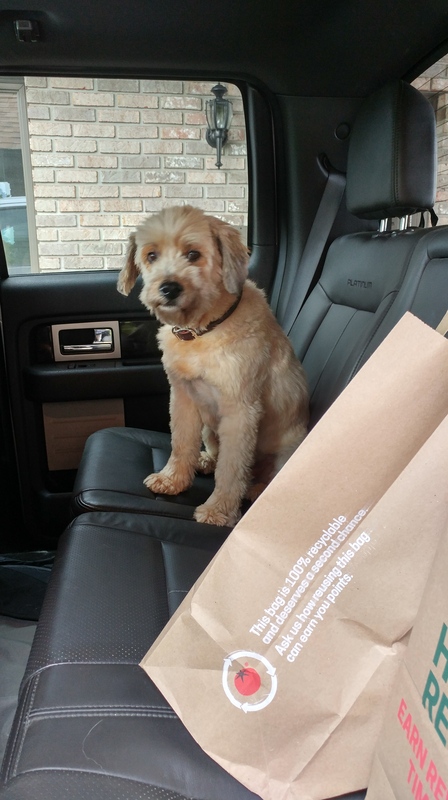 Did I mention what a good traveler he is, jumping into the truck expectantly even though we are just unloading groceries? 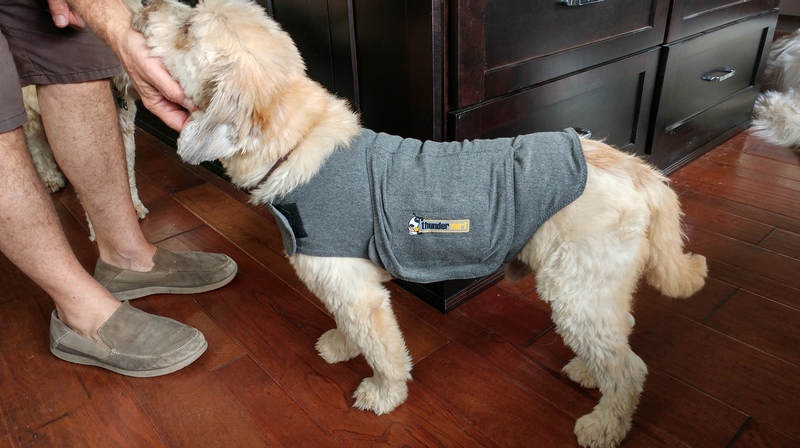 Also, did you see how he looks in his new thundershirt so kindly given to him by a fellow wheaten owner? So, sit back and relax, good buddy, you’re going to be with us for a while. Lemons don’t stay lemons too long around here. Welcome to the next adventure. Good heavens, Lisa and Gordy. How much more can you physically/emotionally do? Bruno is so fortunate to have you caring for him – he has no idea. That’s the point, huh? To have found such love after so much trauma. Am so delighted your sister is coming to live in Ocala. So sweet. Poor little monkey. Been there….. So very sad for Bruno. It is a tough road ahead though I’m betting the time will fly by, as it does…. Keep us updated! It explains so much and I am grateful there is a treatment option, but yikes, I am nervous about getting him through this! He is such a good little boy, so eager to be with and be loved. It’s just got to work, right? Thank you for caring.